The end of the first week is always a favorite part of the session because of our overnights! Tonight, after a day chock full of activities, the girls hiked up to Pete’s Pavilion to sleep out under the stars. Together, they made pita pizzas and s’mores for dinner. Tomorrow morning, the girls will wake up and hike back down to the farm in time for second period! Since the girls are out, the boys had a barbecue back on camp, where they enjoyed farm fresh burgers and cole slaw. 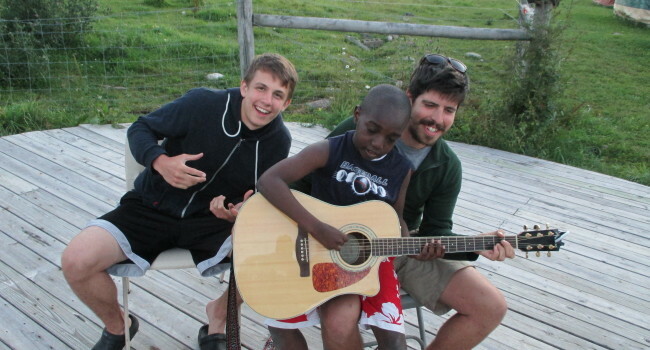 Together, the boys ate, played games, and even made music! For evening program, the boys will gather by the fire ring for a story by our own program director, Alan. The boys are excited to get their turn to sleep out at Pete’s tomorrow evening!